This is one of our bestselling gifts and is a single bottle of Lanson Black Label Champagne. The Champagne is packed in to one of our wooden gift boxes which ensures this is a lovely gift for someone to receive. 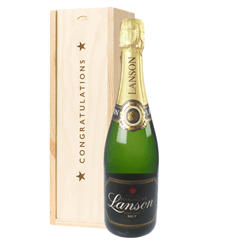 Lanson Black Label is the best selling Lanson Champagne and is the House's non vintage Champagne. It is produced using a combination of 50% Pinot Noir, 35% Chardonnay and 15% Pinot Meunier grapes. These are selected by the Winemaker and added to almost ten different years of reserve wines. The experts say...'It has the taste of spring and subtle hints of long-lasting honey-dew. 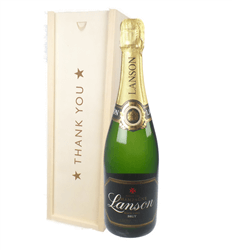 Notes of ripe and citrus fruits give a sensation of lightness and fullness with a long, fresh finish...' Well we're not too sure how Spring tastes but we do agree that Lanson Black Label has a great taste and never fails to disappoint. We classify it as an easy drinker and makes the perfect gift for any occasion.